“We’re going to end on this,” Shyamdas said, as he launched us into the final powerful crest of an epic Hare Krishna chant that undulated like the waves of an ocean for 45 ecstatic minutes (two-part video below). 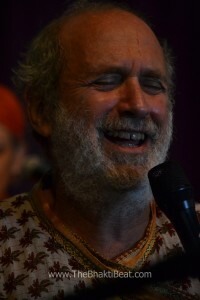 It started as a slow, deep prayer before gradually rising to the inevitable full-on whirling cresendo, then ebbing again to a sweet low longing, barely a whisper, before rising up again… Over and over he led us through the peaks and valleys of the changing melodies and rhythms, inviting us all into the intimate dance with the Divine. Soon there was no distinction between call and response, “performers” and “audience.” All merged as one voice, one ocean of sound and devotion flowing with the joyful tears of a thousand streams. When it ended, after that long sweet silence where you get to do nothing other than breathe in all that bhav, he looked out at all of us and simply said: “That’s it.” Silence broken, the crowd thundered. 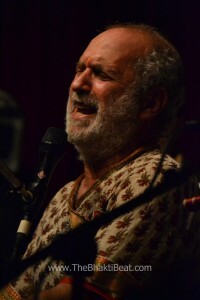 Shyamdas’ kirtans always stand out, but this one was beyond outstanding, and the chanters let him know it. Despite my bhakti-fried brain-deadness, Shyamdas answered my unspoken question. I didn’t write down what he said, but it was something along the lines of: “I was just taking it where it needed to go.” He was reading the room, taking the pulse of the space, feeling the vibe and intuitively guiding us deeper and more completely into that Place That Cannot Be Described, to blissfully drown in a churning sea of ecstatic devotion. This is Shyamdas as we will remember him, steering the ship on a “tidal wave of bhav” deep into the ocean of devotion, sweeping us all along with him on his boat full of bhakti. A note about the videos: Did I mention this was a 45-minute-long Maha Mantra? And that I recorded EVERY moment of it? Now, I know this is the Age of Twitter and 30-second news bites…so I thought about editing this down, cutting and slashing it to a manageable, YouTube-friendly size. But then something slapped me upside the head (Shyam?) and said, Are you crazy? This is a work of devotional art. How dare you mess with it? So I present it to you as I experienced it, in all its uncut, unedited glory. In two parts, because the Age of YouTube has a 30-minute attention span (not long enough for kirtan). Please put aside 45 minutes to watch — really WATCH — because you don’t want to miss a single moment of Shyam-Ji’s in-the-bhav expressionism. Clear your space because you will want to dance during parts. Have some tissues because you may cry. But watch it all. You will not be sorry. Thank you for sharing. I have been deeply moved by spending time with ShyamDas , vrindavan 2005-2006. I feel him so much and I dedicate every chant I sing to Him. Also I think Vimeo allows longer video clip times? Its so sweet, its so sweet. Shyamdas is now part of the nectar of the universe. Hari Bo! Thank you Brenda. This video helped me re-live one of the most powerful experiences of my life. Those of us who were there will never forget it, and the man who made it possible. Thank you Shyamdas-ji, we are blessed to have been in Satsang with a Saint who embodied the Maha. I smiled and I sighed. What a wonderful slice of Shyam! Those of us who were honored to have been in his presence can point to a piece like this to give others a taste of what made him so special. PS. Ah, I thought this was video from BhaktiFest! He took us on an equally ecstatic ride in Madison, summer of 2013. Thanks again for sharing this and keeping us swimming in the bhav. Hey Brenda! Looking back thru this again today…that was BFMW 2012, wasn’t it?! I posted the wrong date…..but the bhav, OHHH the bhav!! There’s no expiration date on that experience. It changed me from some place deep inside, that’s for sure.